This is a common question when people have done their research and have found these two great quality units. Both made by 3D Innovations, both top quality, both provide excellent stability, a wide range of resistance, whisper quiet to operate, and a wonderful warranty. If you want a refresher on what both of these offer here are the links to the full articles. How do you choose when they are both so awesome? 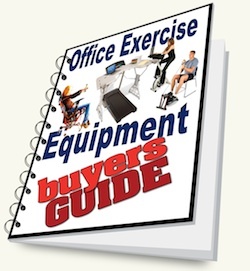 Why do you want to purchase a pedal exerciser? 1. Do you want this for work? Would you like it to fit under your desk? The DeskCycle has the lowest profile. 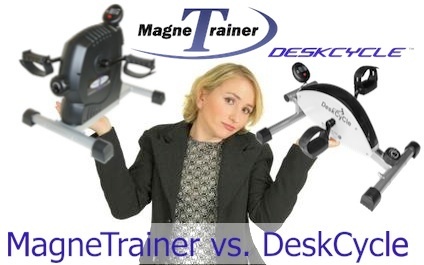 Most people will find their knees will knock the underside of their desk using the MagneTrainer. As well, if you still need the DeskCycle to be a little lower there is a shorter leg available that will drop the height an additional inch. 2. 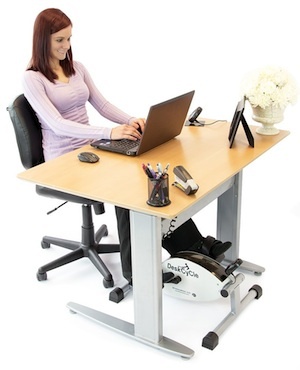 Are you using this at home and plan to pedal in your favourite chair while reading or watching TV? If this is the case you might prefer the MagneTrainer. It has a nice wide foot and the front one extends out for great balance when operated from your EZ-chair. It’s taller and the revolution circumference of the pedals are larger. 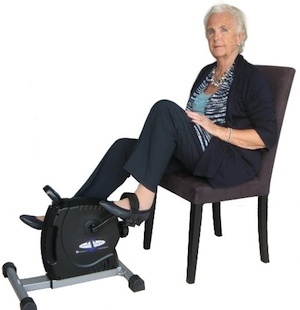 You should also consider the distance required when pedalling in your favourite chair. On the DeskCycle the distance from the center crank to the back leg is 12 inches. 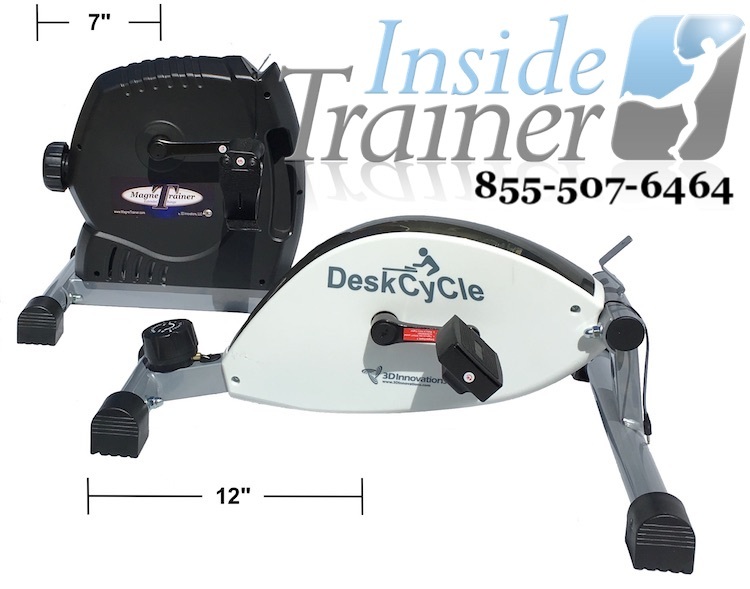 The distance from the center crank to the back leg on the MagneTrainer is 6 inches. Distance from the center crank of the DeskCycle to the back leg is 12 inches. The distance from the center crank to the back leg on the MagneTrainer is 6 inches. 3. Would you like it if you could exercise both upper and lower body? The MagneTrainer is better suited as a arm cycle. The range of motion offered by the longer radius as well as sitting taller for a more comfortable shoulder movement. 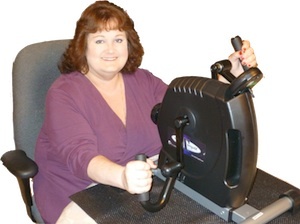 If you want a mini cycle to exercise your arms you should also consider getting the Ergo Handle attachment for greater comfort. 4. Which one give you the better workout? 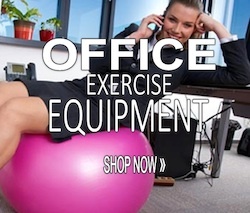 The magnetic resistance on both machines is superior to any of the friction resistance pedal exercisers. The MagneTrainer does offer 30% more resistance at 60 RPM but they pretty much match up at 120RPM. This is 170 Watts compared with 130 Watts. 5. Which one has the larger pedal stroke? 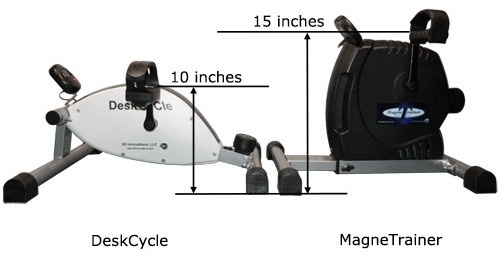 The pedal stroke of the MagneTrainer is 10 inches and the DeskCycle is 7 inches. 6. Which one offers more accessories. The MagneTrainer is often used in clinical settings for Physiotherapy, rehabilitation, senior centres and other similar places. As a result, they have a wide range of accessories so people can get the full benefits offered. Read the full page for more information on the MagneTrainer accessories. Read the full page for more information on the DeskCycle accessories.